Is your banana costume game slipping a bit lately? It happens to the best of us, but we may know just the trick for you to find it a"peel"ing again, and we promise, it doesn't involve a bunch more silly banana puns. 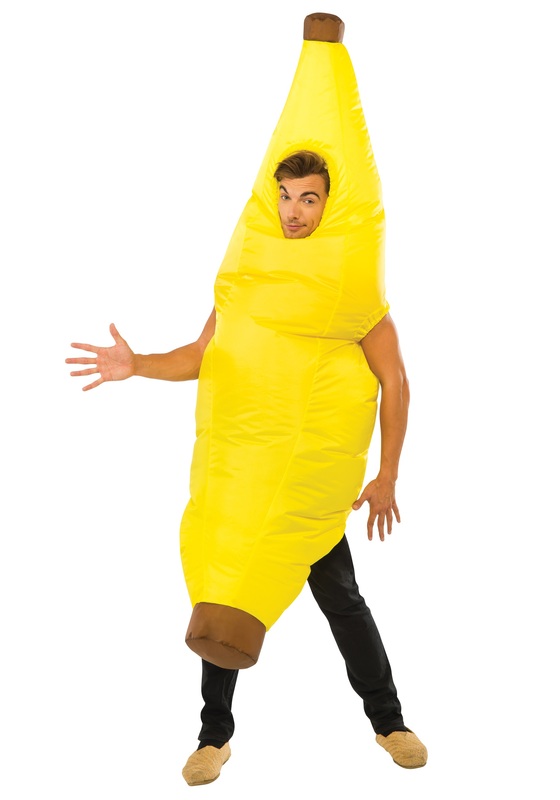 (except for that last one we just had to sneak in) This Inflatable Banana Costume is all you need to look fresh and perky! Everyone who's ever dealt with bananas knows that while they are delicious, nutritious, and much more convenient than any other kind of fruit out there, they have a tendency to go from not-quite-ripe to way-too-ripe in the blink of an eye. If you can hit that sweet spot, when a banana is the perfect shade of golden yellow which indicates it's sweet and soft but not yet slimy, you'd better eat it, because in a few seconds it's going to be mushy and covered and fruit flies! (okay, maybe we're exaggerating a tad, but not by much) The same goes for many banana costumes. They start out perfectly yellow and shapely, but as the party goes on, it gradually loses its pep. By the end of the night, you might as well be wearing a soggy yellow bean bag chair cover. This wacky number solves that pep problem with the battery powered fan built right into it! Elastic around the arm and leg openings, and a drawstring around the face, creates a comfortable seal, so the fan can keep your peel taut and fluffed up all night long. It's (for lack of a better term) bananas!